Hollandaise! It's mayonnaise, but with butter. Do you know why that makes it hollandaise? Because in Holland they fry their bacon in butter. Yes, and it's delicious. The only confusing part is why I never made hollandaise until today. And that confusing part is also an embarrassing part -- hollandaise is one of the Mother Sauces! But at lunch today, hollandaise became a simply ineluctable condiment. I was making a salad, and realized that I wanted some butter. Sadly, there was nothing to spread it on, since I had just run out of bread and wouldn't be baking till tomorrow. And then I knew what I had to do: dress the salad with butter, of course. The time had come for hollandaise. I went straight to the stove and made it. I didn't stop to look in a cookbook or ask the Internet. My conviction was complete, and left no room for doubts or hesitations. I cracked the egg, I melted the butter, I beat it. A pinch of salt, a splash of vinegar. In less than five minutes, I returned to my salad, and poured over it a glossy golden ribbon of sauce, and became a whole woman again. I can still feel it, shining inside me. Gently melt 3-4 tablespoons of butter in a small pan. Turn it off as soon as it is melted. 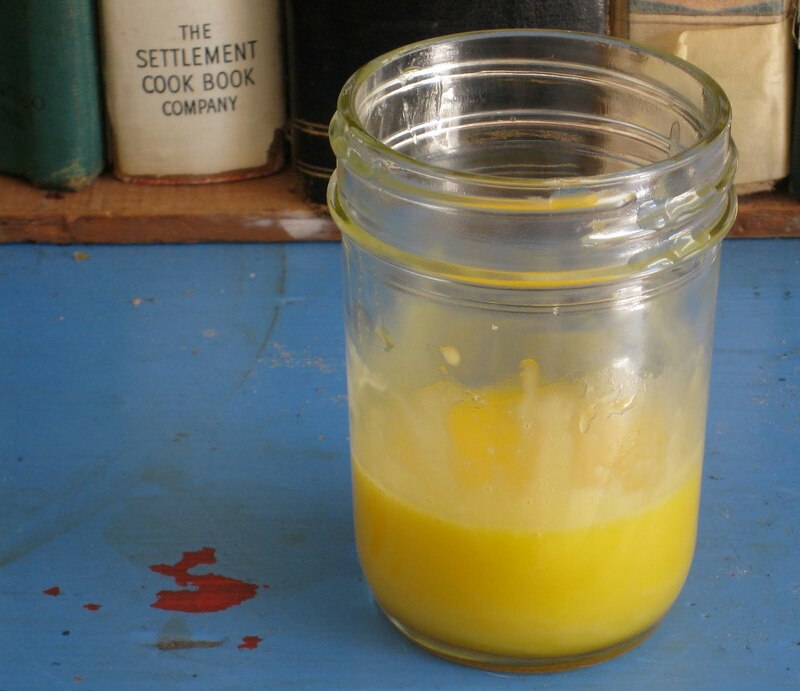 For the hollandaise to be really sunny, use butter from grassfed cows. Separate an egg (and fry the white; why not?). Put the yolk in a small jar or bowl and beat it well. 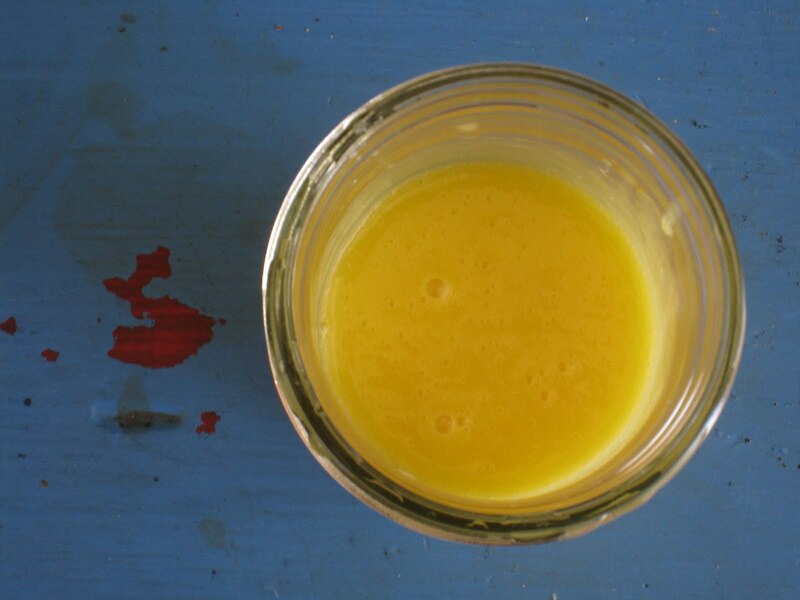 For the hollandaise to be even more sunny and golden, use an egg from a pastured hen. Add some salt and a little apple cider vinegar or lemon juice. I think lemon juice is the preferred thing, but I didn't have any lemons today. Note: this dressed one large serving of arugula-apple salad. Also, now I'm beginning to doubt myself. Surely I've made hollandaise before today? In a little way, for a last minute supper? For crepes at breakfast? I'll ask W. Crawford. I make him eat so many things, and they just float away without recipes to weight them down. Or maybe I dreamt about making hollandaise. That's just as likely. OH MY GOODNESS! I just had an idea. Hollandaise in Waldorf salad. No, better: browned butter hollandaise in Waldorf salad. OH man, Hollandaise and it's even classier cousin Bernaise go on anything. (just tarragon and vermouth, but same thing) I love that you started with salad though, very historic. Especially among the Dutch, doy, makes sense I guess. But realize, you will slop down the slippery Hollandaise slope after your eggs Benedict wax cold. Because it REALLY goes on anything. P.S. A section in the sequel OK? Great idea! Thanks for the recipe, Rosanna. We just received our copy of the cookbook in the mail; I can't wait to jump into it. I love the image of a dish floating away without a recipe to weigh it down. Usually my random dishes are good but not awesome, but sometimes I really wish I could remember what I did to that peanut chicken/cranberry preserves/blackened salmon that made it so perfect. Which of course just leads to further experimentation and fun discoveries, so it all turns out good in the end!